Well, just in case ya'll had a super busy weekend like me (I'm finally getting my energy back! Thanks for all ya'll's prayers and well wishes), I'm taking it upon myself to let you know that Teasers are going on NOW for the new release coming your way this Wednesday, August 4th from My Favorite Things. And oh my oh my, this is a fabulous release with so many new MFT goodies! I've used 3 of the new products on my card for ya'll today. See them? First up is the new stamp set I'm helping to debut. It's one of those cute cute (did I mention cute?) Pure Innocence girls called Being Cute is What I Do. It's actually one of three new PI's coming out this month. The other two "funsies" (I'm liking that new word) I used are two new Die-namics steeel dies that are awesome. It's the new Chain Border and Flower Trio dies. I really love these dies for the way they cut and they are super easy to store. I keep ALL of them right on my desk in one of those carousels from Making Memories--sweet! Ready for some TOP-SECRET news? 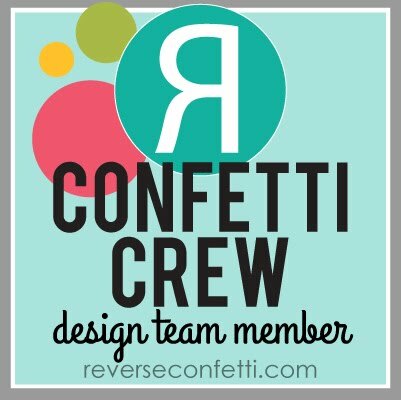 Today, there is a prize hidden on one of the designer's blog posts. As you make your way through the Teaser Time posts, simply leave a comment on each blog, for your chance to win one of the Brand Spankin' New stamp sets being released on August 4th. 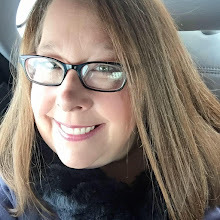 A winner will be chosen from the comments on the pre-selected blog before tomorrow's teaser list goes live, and will be posted on Kim's blog HERE. 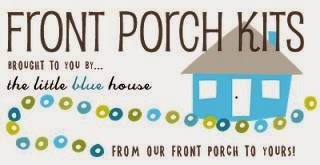 Be sure to check tomorrow to see if YOU are the winner. You can play along each day for your chance to win. We will be giving away NINE new stamp sets this week! 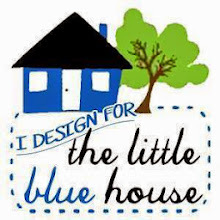 As always, you can find the master list of participating designers HERE on Kim's blog. 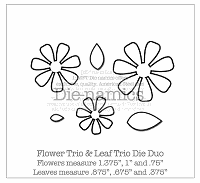 SUSIE Q-TIP: This new Flower Trio Die-namic cuts out three different sized flowers which is totally cool. Either save the leftovers for another project or go ahead and use them to embellish the inside of your card. So nice to see you Saturday! I NEED that flower trio die! I just wrote to Cherie to see if she has it in stock! It's AWESOME! Happy to hear that you're feeling better :) Take it easy, I know how long it can take to get recupe from mono, rest up! OOOH! I totally LOVE her! 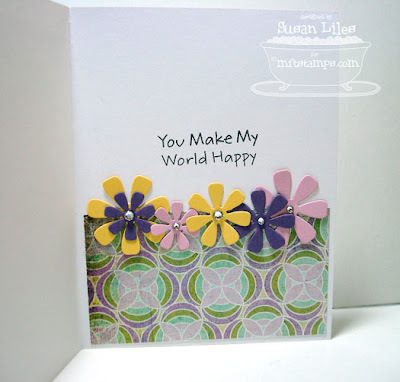 LOVE the colors and papers you used and all those flowers are FANTASTIC!!! I love the flowers and the way you used them inside the card. Very nice. Such a lovely card! You show off the die cuts nicely. Susie this card is BRIGHT, FUN and SO FULL OF LIFE!!!!!! What a fun card! I just love the colors. And the flowers look just too yummy! what a sweet card! I just love all the cute details! So cute, I think that new chain border die is a must have!! Those retro flowers and color choices - just ADORABLE! What a sweet card creation! What fun colors Susan. Too cute. Very cute--I like the purple and turquoise together and thanks for the tip on the flowers. Wonderful colors Susan....and I love what you did with those flower dies...adorable! Cute, cute card! This is my favorite of the new PI stamps! This is SO cute, Susan! I love the colors and papers, and those dies are just perfect! oh my - this is the cutest - I really need this stamp set - she is adorable and I love the color combo used on this card! Oh wow, Susie!!!! GORGEOUS CARD!!!! Super duper cute card! Glad your feeling better! She's adorable. I love how you added the crystals onto the card! thank you for sharing! Adorable! I just love all the PI sets...they're just too cute! I love this card...the colors are wonderful! fun colors & LO and i LOVE the stacked flowers!! ca-ute!! Very cute! I love this new realese. Your card is SUPER DOOPER CA-UTE!! what a fun card! Love the flowers. Oh so cute! Love the way you used the 'funsies'. 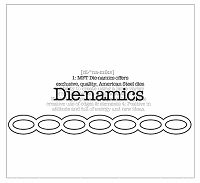 Can't wait to get my hands on those new die-namics. Ooooh! She is super cute! Your card is simply adorable! Thanks for sharing! How lovely so cute I love the colors love the ribbon detail through the background and the inside of the card is great. I love these little PI girls. love that stamp! great colors and i like the flowers continuing to the inside. Lovely and I love how you completed the inside too! oooo! so fresh and funky! this is dalring! LOVE that border on the side! Cute, cute! SO cute! Love the colors you chose! She's just adorable and love all the flowers!